Materials: Cherry finish ash wood, 4 silver aluminum tubes, hand-painted windcatcher. Description: A hand-painted ruby-throated hummingbird makes this a colorful standout. 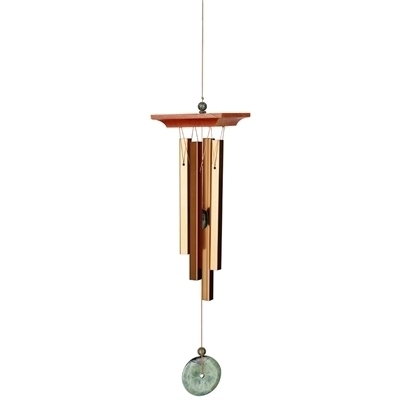 The bright sound of this sweet wind chime expresses the same happy spirit that hummingbirds bring to a garden. The hummingbird is the smallest bird in the world. Its wings beat 56.8 times per second, vibrating the air close to the musical note "A", creating a distinctive hum. Using the same note, we tuned our Woodstock Hummer Chime to an "A" major chord to accompany the hummingbird's flight! This chime's windcatcher is our hand-painted interpretation of a ruby-throated hummingbird. 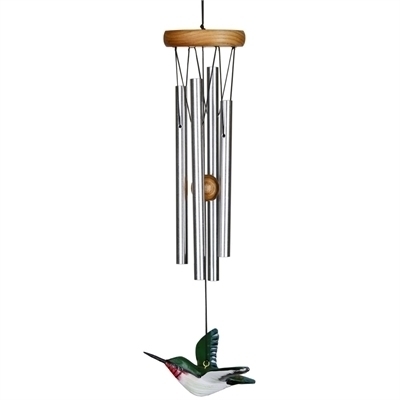 The Hummer Chime is especially appealing to gardeners and bird watchers. 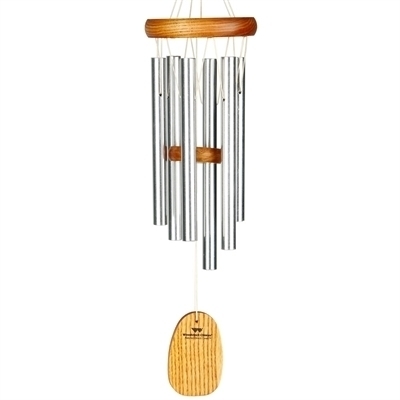 Enjoy this windchime wherever you hum whether in your garden or in your home. This chime carries a lifetime tuning guarantee. Materials: Cherry finish ash wood, 6 silver aluminum tubes. Removable windcatcher for easy customization. Description: One of our most popular tunings, the medium size has a mid-range tone. This chime is tuned to the inspiring tones heard in the opening measures of Amazing Grace, one of America's best loved and most widely known hymns. The lyrics were written by Englishman John Newton in the late 18th century. As a young man on board a merchant ship, Newton underwent a spiritual awakening while caught in a deadly storm at sea. This was the beginning of a journey that would lead the one-time slave trader to become a vocal abolitionist, and transform a man without conviction into one of unshakable faith. It has played an important role in drug and alcohol recovery, the Civil War, the Civil Rights Movement and 9/11. Newton's message of hope and redemption from over 200 years ago resonates with the same power today in our Amazing Grace Chime. Removable windcatcher for easy customization. This chime carries a lifetime tuning guarantee. Materials: Cherry finish ash wood, 4 bronze square aluminum tubes, faux turquoise accents. 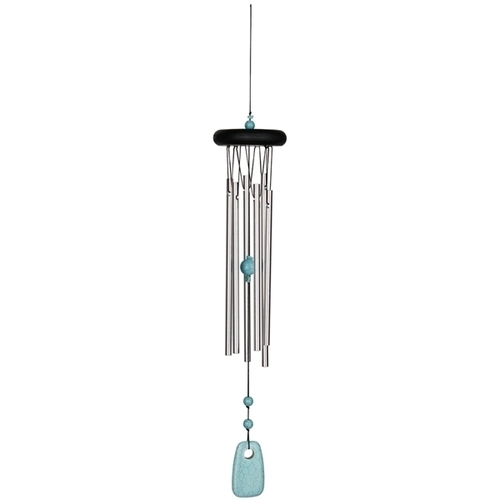 Description: This is a larger version of our best selling Turquoise Chime. The enchanting sound of this wind chime is the result of a special tuning using the "golden ratio." This ratio, discovered by the ancient Greeks, can be found throughout nature. Turquoise gets its beautiful blue-green color from copper and aluminum. It is a process that takes tens of millions of years. In many Native American languages, the translation for the word turquoise is "sky-stone." The color turquoise contains the growth quality of green and the communication quality of blue. Inspired by the rich beauty of this attractive union, we blended colorful beads with a faux turquoise windcatcher to create our beautiful Turquoise Chimes. This chime carries a lifetime tuning guarantee. Materials: Cherry finish ash wood, 5 bronze aluminum tubes. Description: One of our charitable chimes series, a portion of the sale of this chime is given to the Tibet House US to support their goal of preserving Tibetan culture. The enchanting sounds of this wind chime take the listener on a musical journey across the landscape of time. It is tuned to the five tones that make up the principal motif of a work by the great Japanese composer Toru Takemitsu. Commissioned for the Canadian group NEXUS and the Boston Symphony Orchestra to commemorate the 100th anniversary of Carnegie Hall, From me flows what you call Time features two large custom sets of Woodstock Chimes. The windchimes are suspended above the audience and activated by colored ribbons - representing Tibetan prayer flags - that extend from the chimes to the performers on stage. This chime carries a lifetime tuning guarantee. 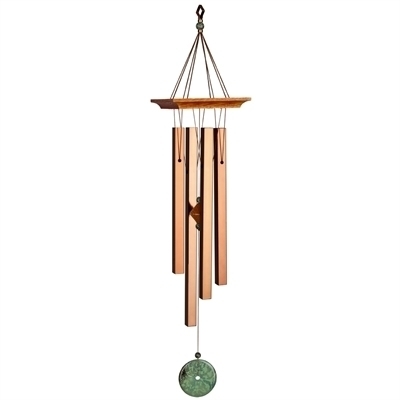 Description: The Corinthian Bells 27" wind chime is a compact chime with an amazing sound at an affordable price. 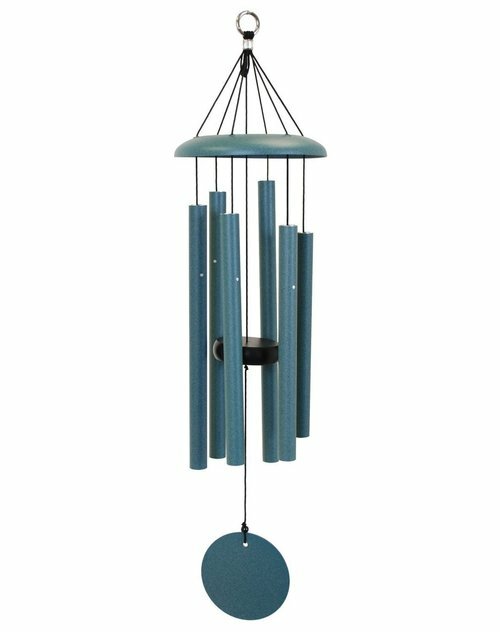 The chime has 6 tubes and is hand tuned to the scale of C. Notes in the chime include C, D, E, G, A, C. QMT Windchimes® has been manufacturing hand-tuned wind chimes in America for over 30 years. 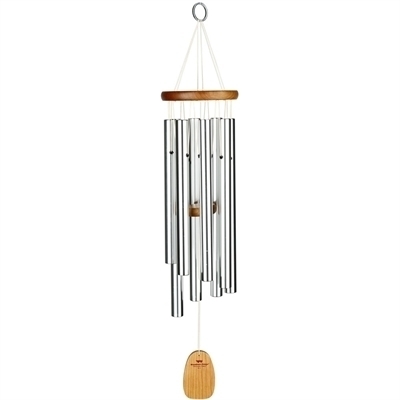 The chimes are manufactured in Manassas Park, Virginia and use raw materials from American lumber and aluminum suppliers. Description: Turquoise has long been admired for its great beauty and brilliant colors. The enchanting sound of this wind chime is the result of a special tuning using the "golden ratio." This ratio, discovered by the ancient Greeks, can be found throughout nature. Turquoise gets its beautiful blue-green color from copper and aluminum. It is a process that takes tens of millions of years. In many Native American languages, the translation for the word turquoise is "sky-stone." The color turquoise contains the growth quality of green and the communication quality of blue. Inspired by the rich beauty of this attractive union, we blended colorful beads with a faux turquoise windcatcher to create our beautiful Turquoise Chimes. This chime carries a lifetime tuning guarantee. 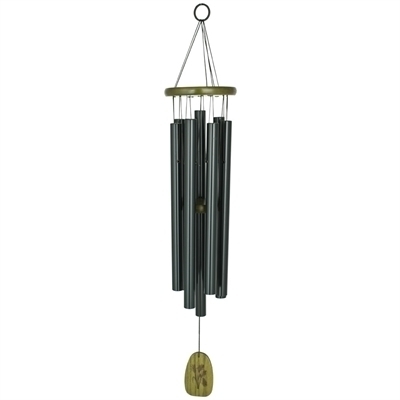 Description: One of our most popular tunings, this petite chime has a high, light tone. This chime is tuned to the inspiring tones heard in the opening measures of Amazing Grace, one of America's best loved and most widely known hymns. The lyrics were written by Englishman John Newton in the late 18th century. As a young man on board a merchant ship, Newton underwent a spiritual awakening while caught in a deadly storm at sea. This was the beginning of a journey that would lead the one-time slave trader to become a vocal abolitionist, and transform a man without conviction into one of unshakable faith. It has played an important role in drug and alcohol recovery, the Civil War, the Civil Rights Movement and 9/11. Newton's message of hope and redemption from over 200 years ago resonates with the same power today in our Amazing Grace Chime. This chime carries a lifetime tuning guarantee. Materials: Walnut finish ash wood, 7 silver polished aluminum rods, genuine hematite, tiger's eye, yellow jade, rose quarts, turquoise, lapis & amethyst stones, silk-screened base (Om symbol), mallet. 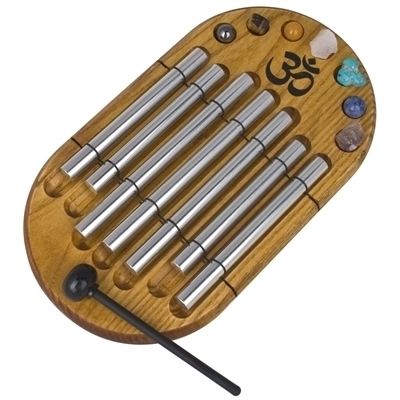 Description: Let the sound vibrations of this chime help keep your chakras in tune. Each of the 7 rods of the Zenergy Chakra Chime is tuned to the related frequency of a different chakra. Tapping a rod with the mallet provided and focusing all of your thoughts on that tone can help maintain good energy flow within your body. This chime comes with the genuine stones associated with each chakra. These can be placed next to the corresponding rod or held as the rod is played. Ancient Hindu beliefs say the secret to our happiness and well-being lies within. There are 7 major energy centers in our body - the 7 chakras - and each one vibrates at its own frequency. When they are all vibrating correctly, all the energy in our body is in balance and we will enjoy good physical, mental and spiritual health. This chime carries a lifetime tuning guarantee. Description: This shimmering chime brings to mind moonlight reflecting on the ocean. 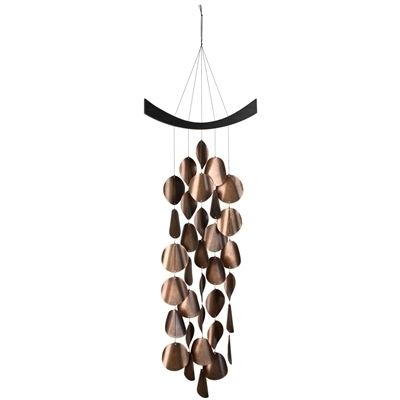 This wind chime got its name from its "curtain" design of antiqued, copper-toned and gently curved steel disks which is beautifully complemented by its welcoming and calming sound. The subtle variety of shadow and reflected light on the cascading disks is reminiscent of the shimmer of moonlight on water. Watching this unique windchime flutter in the breeze recalls warm summer evenings and long walks along the shore. Gazing at this chime as it sparkles and gleams, you can almost hear the waves crashing and feel the sand between your toes. 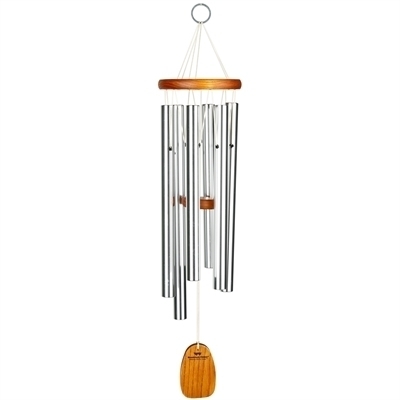 Welcome this elegant chime into your home or garden and let it bathe you in tranquility. This chime has long strings that may tangle in strong winds. You may prefer to hang it in a sheltered area or indoors. Materials: White wash finish ash wood, 4 silver aluminum rods, purple, blue, light blue, green, amber, yellow, red and clear crystal accents. 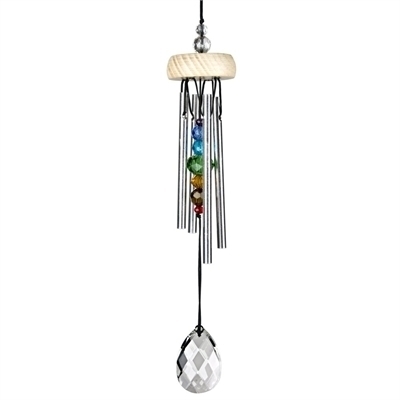 Description: A rainbow of crystals adorns this lovely wind chime with its fairy-like sound. If windchimes were made in a magic land at the end of the rainbow, they would probably look something like our Woodstock Gem Drop Chimes. A delight to the eyes and ears, they are delectable little treats for the home and garden. What's more, they all sound great together so you can collect the whole set! Materials: Black finish ash wood, 6 silver aluminum tubes and 4 black aluminum rods - removable windcatcher for easy customization. Description: This windchime recalls the soft melody of Johann Pachelbel's celebrated Canon in D. A prolific composer and an accomplished organist, Pachelbel wrote for the organ, harpsichord and voice - his Canon in D is one of his few chamber works known today. With its graceful melody and stately tempo, it is a popular choice as a wedding processional, for within its measures we hear the sounds of hope, joy, love and promise. The clever design incorporates 4 small rods that harmonize beautifully with the 6 chime tubes. 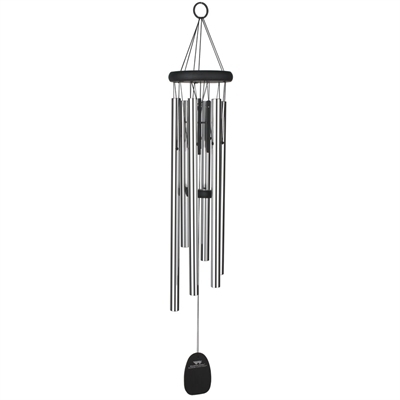 This windchime is the perfect gift for virtually any occasion. Removable windcatcher for easy customization. This chime carries a lifetime tuning guarantee. Description: Turquoise represents the Throat Chakra - sound and self-expression. The Throat Chakra involves communication, sound and creativity. Woodstock Chakra Chimes combine color and sound to underscore the ancient meaning of the major energy centers of the human body. Eastern Philosophy can often be difficult for the Western scientific mind to assimilate and yet, many of the eastern claims are being proven scientifically as the time honored truths that they are. According to the traditions, there are seven basic chakras, which correlate to the seven main nerve ganglia emanating from the spinal column, as revealed through modern studies of physiology. Each Chakra location has a unique meaning, orientation and healing potential. The beautiful windcatcher of each of our Woodstock Chakra Chimes is a colorful stone associated with a particular Chakra. These wind chimes are intended to remind us of the strength of mind over matter and, through sound, give us a small window into the balance of the physical and metaphysical. Description: This wind chime is tuned to the joyful tones of the alphorn melody from the finale of Johannes Brahms' Symphony No 1 in C minor. The German-born Brahms spent 15 years writing this piece, which he completed in 1876. A land of rolling hills, pine forests, charming alpine villages and sparkling lakes, Bavaria lies at the heart of Europe. Here, the Germans brew a rich, creamy-tasting beer called Weizenbier, or wheat beer. In accordance with the German Purity Law of 1516, it is made using only water, malt, hops and yeast for the very finest quality and flavor. We adhere to a similar philosophy and tune our Woodstock Chimes using pure musical intervals for the most beautiful sound. Reflecting the fields of Bavaria, this windchime features a wheat image burned into the wood of the windcatcher. This chime carries a lifetime tuning guarantee. Description: Calm and uplifting - offers a peaceful respite from the hectic world. Experience the inner quiet that comes from listening to the peaceful patterns of Gregorian chant. Tuned to a medieval scale, this wind chime echoes the vocal music that has been sung as a part of daily devotionals and meditation in the monasteries and churches of Western Europe for more than a thousand years. Many believe this music to have remarkable healing powers. The sound is beautiful, relaxing and mysteriously compelling. 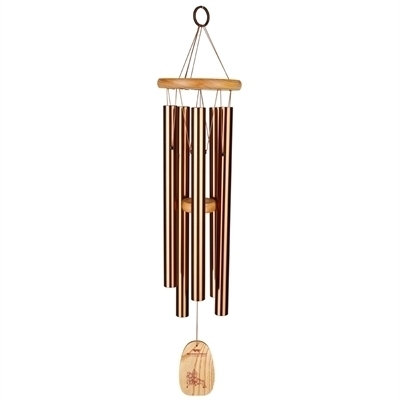 Like the free-flowing monophonic lines of the chant, this windchime's resonant tones will surround the listener as the sounds linger in the breeze. All of the Woodstock Gregorian Chimes - Baritone, Tenor, Alto, Soprano and the Little Gregorian - harmonize beautifully together. This chime carries a lifetime tuning guarantee.